US born pianist and composer Ethan Iverson is probably best known as a founding member of the iconic New York based band The Bad Plus, a game-changing collective who the New York Times described as "…better than anyone at melding the sensibilities of post-60’s jazz and indie rock.” During his 17-year tenure TBP performed in venues as diverse as the Village Vanguard and Carnegie Hall and collaborated with the likes of Joshua Redman, Bill Frisell and the Mark Morris Dance Group. Ethan himself includes appearances with International jazz artists of the calibre of Billy Hart, Ron Carter Tom Harrell, Victor Lewis, Chris Potter and Ravi Coltrane. As a composer, in 2017 he scored “Pepperland” for the Mark Morris Dance Group and in spring 2018 premiered Concerto to Scale with the American Composers Orchestra. A powerful yet thoughtful and lyrical player, it is with great pleasure that we welcome this impressive musician of International standing to the Club this evening. 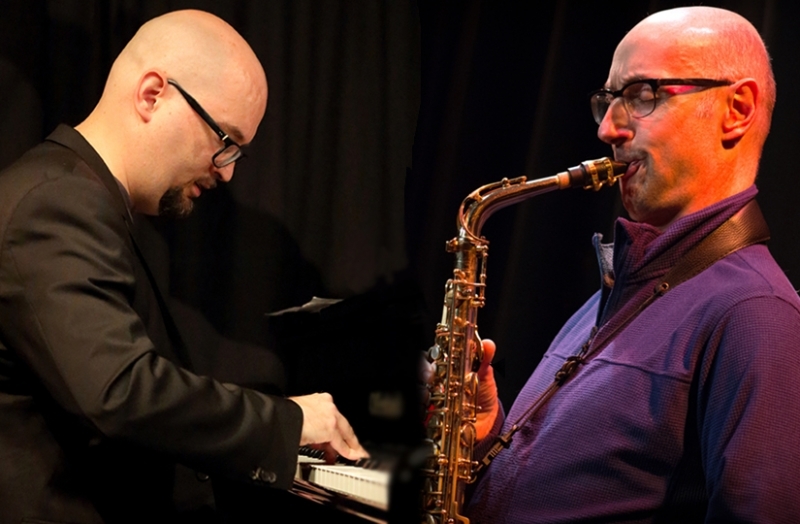 Appearing with Ethan will be one of the UK's most prominent alto sax players, Martin Speake. An Award wining musician Martin has been at the forefront of the UK jazz scene since the mid 80's. His projects are many and diverse and include personal interpretations of the music of Charlie Parker, free improvising, playing standards with his quartet and Indian music with Dharambir Singh and Sarvar Sabri. He has recorded 23 cds under his own name, including the internationally acclaimed ECM release Change Of Heart with Paul Motian, Bobo Stenson and Mick Hutton and includes work with the likes of Loose Tubes, Stan Tracey, Django Bates, The Style Council and Airto Moreira on a massive cv. Martin is also a committed jazz educator, teaching at Trinity Laban Conservatoire, the Royal Academy of Music and the Guildhall School of Music and Drama. Martin and Ethan met in Canada at the Banff Centre for the Arts in 1990, and theirs has been an ongoing, though sporadic collaboration. They recorded the CD “My Ideal” in 2002 for Basho Records; fifteen years later, their quartet album "Intention" with Martin’s compositions plus arrangements of Charlie Parker’s ‘Charlie’s Wig’ and the standard ‘Dancing In The Dark’ (Ubuntu Music) was released. The combination of Ethan's searching, sophisticated piano playing and Martin's fluent and creative sax work produces wonderful music of the highest calibre. This is their only London performance.